Introducing Oakland’s newly signed 2018 first-round draft pick Kyler Murray, VP of baseball operations Billy Beane had trouble naming a player of past or present with comparable talent. Murray, who moonlights as a dual-threat quarterback expected to take the reigns of the University of Oklahoma football team this fall, was the most athletically gifted prospect in the draft — at least according to his agent, Scott Boras. At 5-foot-11, 200 pounds, Murray has registered a sub-4.40 40-yard dash, translating to less than four seconds second home to first — or on par with baseball’s fastest man, Billy Hamilton. He also registered 10 stolen bases and 10 home runs in 51 games with the Sooners this season. 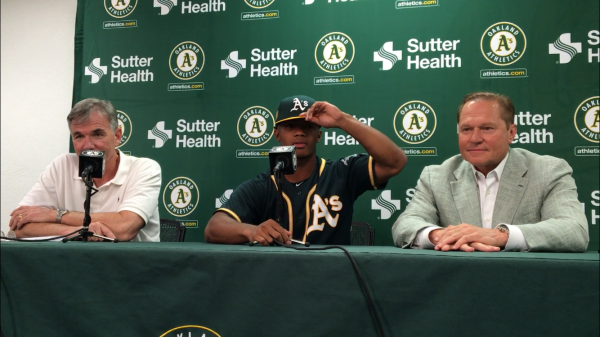 Oakland Athletics 2018 first-round draft pick Kyler Murray (middle) sits between agent Scott Boras (right) and A’s VP of Baseball Operations Billy Beane (left) at a press conference Friday, June 15, 2018 at the Oakland Coliseum. 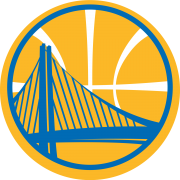 Murray was finally introduced as the newest member of the Athletic organization Friday, after being drafted No. 9 overall in the MLB draft on June 4. On the surface, it appeared that the hangup delaying his signing was his intention to play football his junior year, after watching his predecessor Baker Mayfield win the Heisman Trophy while leading Oklahoma to the NCAA Football Playoffs before being drafted with the first overall selection — to play football. Beane’s statement — perhaps along with his rescuing of the youngster — drew applause from the 15 or so Murray family members and friends in attendance. Beane went so far to say that he looked forward to watching his firs-round pick hit the gridiron, adding that he was considering a trip to Norman, Oklahoma for the Sooners’ showdown with UCLA on Sept. 8. Melvin, a UC Berkeley alum and regular at Cal sporting events said his interest in Big 12 football has increased over the past two weeks as well, though he joked he’d be watching Oklahoma play with his ears and eyes covered. 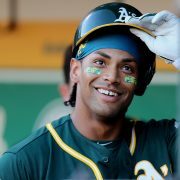 When his junior season finally does finish and he joins the A’s organization, he will continue a legacy of two-sport athletes in Oakland. Jeff Samardzija, though his stint with the A’s was short (16 games) was a name that Melvin drew. Perhaps the most recognizable name among those ranks, though, is that of Bo Jackson, who was selected to the 1990 NFL Pro Bowl with the Oakland Raiders and the 1989 MLB All-Star as a member of the Kansas City Royals. Jackson won the All-Star Game MVP in 1989, becoming the second player ever to steal a base and hit a homer in the Midsummer Classic (Willie Mays, 1960). If the A’s have found type of talent — though Jackson was more known for power while playing at Auburn — they uncovered an absolute gem. But it wasn’t as easy as putting away the pads and picking up a bat. As a redshirt sophomore, Murray struggled on the diamond collecting just six hits in 49 at-bats (.122 average) with zero homers — although he still found himself on base enough to swipe 12 bags. That was another feather in his fluffy hat, as Melvin said. The fact that Murray found the time, around his studies (he was an Academic All-Big 12 Second Team selection) and his football, to put in the work at the plate to make that sort of turnaround shows not only the natural gifts necessary to become the athlete he is but the work ethic. That work, which Murray said comes natural, has allowed him to sharpen all the tools of the trade — as he said, he can lay down the much-needed bunt or hit the big home run. At least once more, Murray will have to bounce back then forth. At least one more time, though it may be until February, Murray will put his batting gloves and metals cleats away in favor of a mouth piece and signal-caller.